Submitted by vida on Friday, January 2, 2009 - 1:40pm. As a college kid, the first thing you should probably know before sitting down are the dreaded two words, “Cash Only.” But no worries, there’s a WaMu right across the street. Street parking is metered and a little difficult, but worth it. The restaurant is located next to theatres, studios, and a flair of other artsy type places and the crowd reflected the atmosphere. Prices ranged from as low as $3.50 to $10.00. The decor was very “eclectic” as my friend put it. Although the presentation wasn’t great, and the wait was 30-45 minutes for a party of two, the taste made up for it. 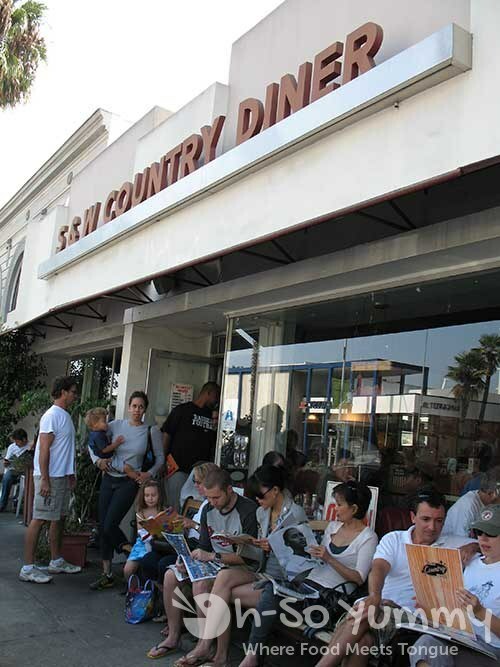 Apparently the wait is not uncommon as the restaurant is small and well-known by locals. It didn’t seem like a long wait because of the patient crowd of people, the benches available for seating, and of course, the good company. On to the food. 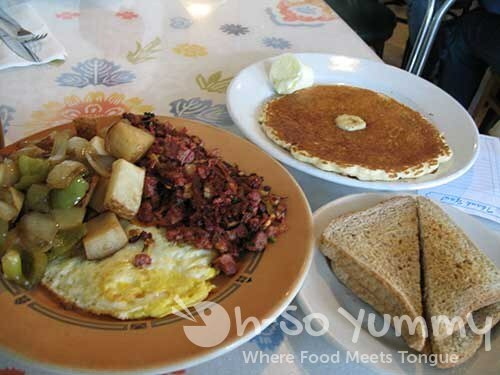 My friend ordered Corned beef hash, which, from what I gather is brisket and potatoes, a side of potatoes, 2 eggs (over-hard) and a banana pancake. I didn’t try the corn beef hash or the potatoes and eggs but the egg was supposed to be over-hard yet still had yolk and she didn’t like the fact that the potatoes had green bell-peppers and not red. In her opinion, the red would have had more flavor and in my opinion, it would have looked more presentable. The banana pancake was delicious; the banana wasn’t mushed up on the inside, and actual pieces could be found. They tasted like they were part of the pancake, yet retained that distinct banana texture. My only reasoning is that they were sliced to the perfect thickness in order to be so soft and full of banana flavor without melting into the batter or tasting out of place. The pancake itself was also the right thickness and wasn’t crispy or mushy. I ordered lunch. 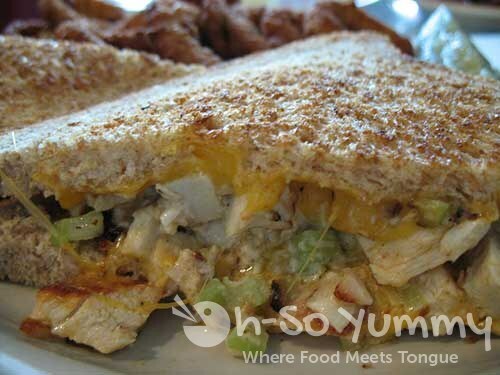 S and W’s famous chicken salad melt and a side of onion rings. It was all quite tasty. The wheat bread was toasty and crunchy, the sandwich wasn’t prone to falling apart like so many other chicken/tuna salad sandwiches I’ve experienced and it was all put together so well that I could cut the sandwich into pieces without any of the filling falling out. The chicken breast was fresh and the amount of mayo was sparse and did not overpower the taste. The cheddar was melted nicely and I love cheese so I was glad there was plenty. The onion rings were good; the batter was thick but didn’t cancel out the taste of the onions.